The generation and marking of pipes is often very important in any business for the purpose of safety. 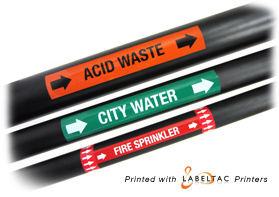 Markers that are put on pipes are very ideal in conveying messages to users such as pipe content material, preventive measures to keep the users safe, potential hazards and direction of flow of the liquid inside. Pipe marking labels are therefore very effective and convenient in keeping the pipe user and other workers around secure while operating in the work place. You should note that pipe marking labels are made by professionals who are able to identify the safe and unsafe pumps to use. They then mark them based on the fluids the pipe carries. Pipe markings are not only meant to send a cautious message to people in the work place, but also to remind and make people conscious of what the pipe is carrying. Pipe marking labels often spell out the dangers involved and sometimes offer methods of hoe you can avert them. The labels on the pipes seem like tags that are mounted or stuck on a pipe. The text that is often written on the label should be made out of a clear and visible font that can be easily read. It should also use simple grammar and be straight to the point. This will help readers to easily understand and interpret it. If no one can neither read nor understand it, then it will have failed in its purpose of conveying a warning message and its better of removed. This is because such pipe marking labels can send mixed messages that will get people more confused. It is also likely to increase the chances of an accident as people might misinterpret it. Where do I place pipe marking labels? There are a wide variety of pipe marking labels in the society. The markings can be produced from a variety of materials based on their usage. The area of usage also determines the type of pipe marking label to be used. It’s therefore mandatory to consider the location and usage of the pipe before you start marking it. This is because different locations require different pipe marking material. You’ll probably need a stronger and durable pipe marking for pipes located on the outside of the warehouse or working place (external) as compared to a pipe meant for inside us (internal). You should also consider the fact that dimensions; pipe markers style and color will ensure it’s visibility from a long distance or a dimmed or dark area. The material or color used for this must be reflective.